Shirane is an expert on Japanese literature, cultural history, and visual culture, and serves as the Shincho Professor of Japanese Literature and Culture in the Department of East Asian Languages and Cultures and Chair of East Asian Languages and Cultures at Columbia University in New York City. 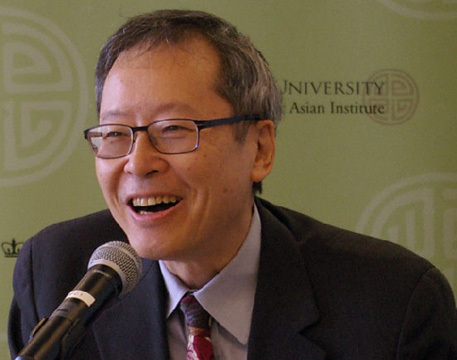 He is also affiliated with the Weatherhead East Asian Institute. His disciplinary interests include Japanese literature and cultural history, particularly classical and early modern literature, with special interest in prose fiction, poetry, and literary theory. Shirane also pursues his interests in the interaction between popular and elite cultures, issues of cultural memory and language, ecocriticism, and cultural constructions of nature. In 2010, he was awarded the Ueno Satsuki Memorial Prize on Japanese Culture for his contributions to the study of Japanese culture. We are pleased to celebrate Haruo Shirane, and to bestow this honor from the American Haiku Archives, which seeks to preserve and promote haiku and related poetry throughout the North American continent. The American Haiku Archives, which includes the Haiku Society of America archives, is the largest public collection of haiku materials outside Japan. Each year since the archives were established on July 12, 1996, the AHA advisory board, currently chaired together by Garry Gay and Randy Brooks, appoints a new honorary curator (an idea suggested by the former California state librarian, Dr. Kevin Starr). Past curators, in order starting from the first year, have been Elizabeth Searle Lamb, Jerry Kilbride, Cor van den Heuvel, Robert Spiess, Lorraine Ellis Harr, Leroy Kanterman, William J. Higginson, Makoto Ueda, Francine Porad, Hiroaki Sato, H. F. Noyes, George Swede, Stephen Addiss, Gary Snyder, Jerry Ball, LeRoy Gorman, Charles Trumbull, Marlene Mountain, and Ruth Yarrow. The AHA advisory board is delighted to pay tribute to Haruo Shirane as the twentieth honorary curator of the American Haiku Archives. Japan and the Culture of the Four Seasons: Nature, Literature, and the Arts. The Demon at Agi Bridge and Other Japanese Tales. Edited with introduction by Haruo Shirane. Translated by Burton Watson. Columbia University Press, 2010. New Horizons in Literary Studies: Canon Formation, Gender, and Media. Editor and author. Benseisha Press, 2009. Envisioning The Tale of Genji: Media, Gender, and Cultural Production. Editor and author. Columbia University Press, 2008. Early Modern Japanese Literature: An Anthology, 1600–1900. Abridged Edition, Columbia University Press, 2008. Traditional Japanese Literature, Beginnings to 1600: An Anthology. Editor and author. Columbia University Press, March, 2007. Classical Japanese Reader and Essential Dictionary. Editor. Translated by Burton Watson. Columbia University Press, 2006 (paperback, 2008). The Longman Anthology of World Literature: The Medieval Era. The Longman Anthology of World Literature: The Seventeenth and Eighteenth Centuries. Early Modern Japanese Literature: An Anthology. Editor and author. Columbia University Press, 2002. Inventing the Classics: Canon Formation, National Identity, and Japanese Literature. Coeditor with Tomi Suzuki and author. Stanford University Press, 2001. Korean edition translated by Sook Young Wang, Somyong Publishing Company, 2002. Traces of Dreams: Landscape, Cultural Memory, and the Poetry of Bashô. The Bridge of Dreams: A Poetics of The Tale of Genji. From the Perspective of the Environment: Japanese Literature and the Ecocriticism (Kankyô to iu shiza, Nihon bungaku to ekokuritishizumu). Coeditor with Watanabe Kenji, Noda Kenichi, and Komine Yasuaki. Benseisha, 2011. Viewing Japanese Literature from Literary Theory (Nihon bungaku kara no hihyô riron). Editor (with Fujii Sadakazu and Matsui Kenji) and author. Kasama shoin, 2009. Coeditor with Komine Kazuaki and Watanabe Kenji, and author. Shibundô, 2008. Kôza Genji monogatari no kenkyû: Kaigai ni okeru Genji kenkyû. Editor and author. Ôfû, 2008. Bashô no fûkei: bunka no kioku. Sôzôsareta koten: kanon keisei, kokumin kokka, Nihon bungaku. Coeditor with Tomi Suzuki and author. Shinyôsha, 1999. Yume no ukihashi: Genji monogatari no shigaku. Shirane, Huruo. “Beyond the Haiku Moment: Bashô, Buson, and Modern Haiku Myths.” Juxtapositions: The Journal of Haiku Research and Scholarship 1.1, (2015). Shirane, Haruo and Robert D. Wilson. “Haruo Shirane Interviewed by Robert D. Wilson.” Simply Haiku 9.1, (2011). Shirane, Huruo. “Performance, Visuality, and Textuality: The Case of Japanese Poetry.” Oral Tradition, 20.2, (2005). Shirane, Haruo and Udo Wenzel. “Traces of Bashô: An Interview with Haruo Shirane.” Simply Haiku 10.2, (2013).